"The remarkable, swinging young trio calling themselves The Three Sounds all share an ability to combine a thoroughly modern conception with an apparently instincitve feeling for some really earthy jazz roots." During the mid-to-late 50's, jazz piano trios sprung up across the nation. Perhaps it was the popularity of Oscar Peterson or Errol Garner or the stylization of the intimate image a piano trio can evoke, but for whatever reason, the piano trio explosion was in full gear. There was The Ahmad Jamal Trio, The Red Garland Trio, The Ray Bryant Trio, The Bill Evans Trio, The Ramsey Lewis Trio just to name a few. They were all modern jazz units. Some trios served as the core group backing up a singer. Ella Fitzgerld had The Tommy Flanagan Trio, Joe Zawinul's Trio backed Dinah Washington (after Wynton Kelly's trio had done the same). The Art of the Trio is taken by jazz musicians as seriously as the Art of the Fugue is studied by organists. Even though the basic instrumentation is the same (piano, bass and drums) an avid listener could easily discern the differences between the Hampton Hawes Trio and The Sonny Clark Trio. Each trio had its own signature, a way of weaving various influences into a cohesive statement and direction. The Three Sounds were part of the trio explosion. Begun in 1956 in Benton Harbor, Michigan as the Four Sounds and consisting of Gene Harris on piano, Andrew Simpkins on bass and Bill Dowdy on drums (the saxophonist was dropped by the time the group moved to Washington, D.C. in 1957). The "Sounds" eventually migrated to New York City where they were 'discovered' by Lou Donaldson. After a single record for Riverside with Nat Adderley, the Three Sounds signed an exclusive contract with Alfred Lion of Blue Note Records. This move was fortuitous for Blue Note. The Three Sounds had a natural chemistry and beautiful rapport with the audience. The national audience began to build for the group, and soon the Three Sounds were playing clubs across the country. The group did very well in the booming jukebox business evidenced by the large number of singles that Blue Note released on 45-rpm vinyl. Alfred Lion's strategy for the group was simple; record them as often as possible, playing material rehearsed in clubs and fine tuned for the recording session. Sometimes a single session would yeild not one but two LP's worth of material. Over the course of 5 years (1958-62, the 'classic' trio years), the "Sounds" released 9 LPs and appeared on albums by Lou Donaldson and Stanley Turrentine. After the group left Blue Note for Verve (two albums in 1962) and then both Limelight and Mercury (1962-66), the Three Sounds returned to Blue Note, but with a different series of drummers. Gene Harris kept the band going until he signed with Blue Note as a solo artist in 1973. 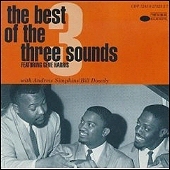 But for those classic years in the late fifties and early sixties, the Three Sounds were a fantastic, dynamic group. 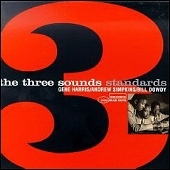 A selected discography of The Three Sounds albums. 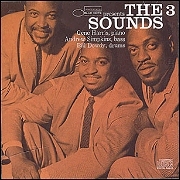 Introducing The 3 Sounds, 1958, Blue Note. Bottoms Up, 1959, Blue Note. Good Deal, 1959, Blue Note. Feelin' Good, 1960, Blue Note. Here We Come, 1960, Blue Note. Hey There!, 1961, Blue Note. Out Of This World, 1962, Blue Note.